Met Gala or formally called the Costume Institute Gala and also known as the Met Ball, is an annual fundraising event for the benefit of the Metropolitan Museum of Art’s Costume Institute in New York City. It marks the grand opening of the Costume Institute’s annual fashion exhibit.Each year’s event celebrates the theme of that year’s Costume Institute exhibition, and the exhibition sets the tone for the formal dress of the night, since guests are expected to choose their fashion to match the theme of the exhibit. The Theme of 2018 Met Gala was ” Heavenly Bodies: Fashion and the Catholic Imagination“.It was held in New York’s Metropolitan Museum of Art on Monday evening. Priyanka Chopra and Deepika Padukone attended the 2018 Met Gala from India. Priyanka, 35, walked the red carpet at in a Ralph Lauren velvet gown accessorised with a bejeweled hood .Deepika Padukone, 32, wore a red Prabal Gaurang gown with an extended thigh-high slit paired with diamond and pearl earrings and a matching ring. Ariana Grande wearing Vera Wang. Amal Clooney wearing Richard Quinn. Kate Bosworth wearing Oscar de la Renta. Anne Hathaway wearing Valentino Haute Couture. 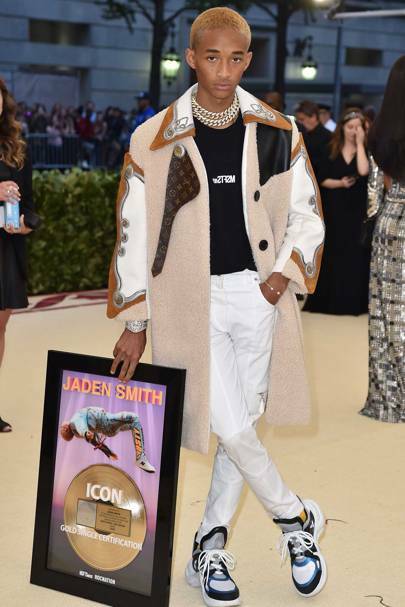 Jaden Smith wearing Louis Vuitton. Selena Gomez wearing Coach and Tiffany & Co jewellery.